HOUSE WITHOUT ROOF is about the journey of the siblings LIYA, JAN and ALAN who were born in the Kurdish area of Iraq and grown up in Germany. The three of them want to fulfill their mother`s last wish to bury her in her home village beside her husband who got killed in the war under the Saddam Hussein regime. On their nerve-wracking Kurdish-odyssey, they are not only faced with their Kurdish extended family that does not accept the last wish of their mother but particularly with their own matters. In recent years they distanced from each other – everybody runs his own life – and whenever they are holding talks, they are mostly based on reproaches. In parallel with the run of their journey, it is noticeable that in their home country the dimension of an awful conflict, that nobody can surmise, is heading for disaster. 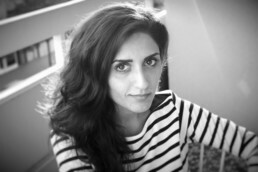 Soleen Yusef was born in Duhok, Iraqi Kurdistan in 1987. At the age of nine, she and her family fled to Germany because of political reasons. After graduating high school she attended the Academy of Stage Arts and was trained as singer and actress. Moreover, she worked as a production assistant and assistant director for the production company mîtosfilm. In 2008 she started studying feature film directing at the Baden-Wurttemberg Film Academy. Her Film TRATTORIA, which she has made in her third year premiered at the Berlin International Film Festival in 2012. HOUSE WITHOUT ROOF is at the same time her graduating project and first feature film and has been shooting in spring 2015 in and around her hometown Duhok.